This species has 7-8 dark bars on each flank which are equal in width, or slightly wider than, the pale interspaces between. Specimen in its natural habitat, Upper Mae Nom river, Thailand. Known from the Xe Bangfai and Xe Bang Hiang river drainages in Laos, both of which are part of the middle Mekong basin, plus the south-eastern province of Chanthaburi, Thailand. Restricted to shallow, fast-flowing, highly-oxygenated headwaters and minor tributaries characterised by stretches of riffles and runs broken up by pools or cascades in some cases. The most favourable habitats contain clear, oxygen-saturated water which, allied with the sun, facilitates the development of a rich biofilm carpeting submerged surfaces. During periods of high rainfall some streams may be temporarily turbid due to suspended material dislodged by increased (sometimes torrential) flow rate and water depth. In the Khao Soi Dao Wildlife Sanctuary, Chanthaburi province, Thailand otherb fish species include Garra cambodgiensis, Mystacoleucus marginatus, Puntius binotatus, P. orphoides, P. partipentazona, Danio albolineatus, Rasbora borapetensis, Pangio myersi, Barbucca diabolica, Lepidocephalichthys berdmorei, Homaloptera smithi, H. zollingeri, Nemacheilus binotatus, N. platiceps, Glyptothorax fuscus, Macrognathus circumcinctus, Parambassis siamensis, and Pseudogobiopsis oligactis. Not difficult to maintain under the correct conditions meaning we strongly recommend keeping it in a tank designed to resemble a flowing stream or river with a substrate of variably-sized rocks, fine gravel and patches of sand. This can be further furnished with a few driftwood branches arranged to form a natural-looking scene. While the majority of aquatic plants will fail to thrive in such surroundings hardy types such as Micropterus, Bolbitis or Anubias spp. can be grown attached to the décor. Though torrent-like conditions are unnecessary it does best if there is a high proportion of dissolved oxygen and decent water movement in the tank so external filters, powerheads and air stones or two should be employed as necessary. Like many fishes that naturally inhabit running water it’s intolerant to accumulation of organic pollutants and requires spotless water in order to thrive, meaning weekly water changes of 30-50% tank volume should be considered routine. Omnivorous although the bulk of the diet probably consists of small insects, worms, crustaceans and other zooplankton with only relatively small amounts of plant matter and organic detritus consumed. In the aquarium dried foods of a suitable size are accepted but should not be used exclusively; daily meals of small live and frozen fare such as Daphnia, Artemia, bloodworm, etc., will result in the best colouration and condition. Fishes which inhabit similar biotopes in nature, especially those which swim in open water such as Danio, Devario, Mystacoleucus, smaller Barilius, plus some Pethia, ‘Puntius‘, and Rasbora species constitute the best options, and one or two decent-sized schools can make a visible difference to the confidence of this naturally reclusive loach. 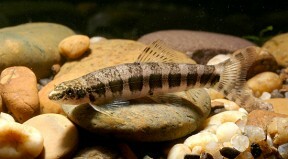 Other possibilities include balitorids like Gastromyzon, Pseudogastromyzon, Beaufortia, and Sewellia plus Crossocheilus and Garra species. Similarly-shaped relatives such as other Nemacheilus, Acanthocobitis, and Schistura spp. are not really recommended although a combination may work in larger aquaria. This species is peaceful with conspecifics and seems to appreciate being maintained in a group. The purchase of four or more specimens is highly recommended. The genus currently contains just three members all of which are known only from the Mekong basin. S. octozona is the type species and separated from the others mainly by body patterning which consists of 8-9 pale, relatively thin bars on each flank, these extending the full depth of the otherwise dark-coloured body. In S. cingulata there are 7-12 thin, dark bars mostly not extending the full depth of the otherwise pale body whereas S. zonata has a pale body with 7-8 regular, dark vertical bars and thin, dark median bars on the pale interspaces in some specimens. Post-description the position of the genus within the superfamily Cobitoidea was uncertain because it had not been included in any genetic analysis, plus members possess a confusing combination of characters. For example the general body shape, shape of the swim bladder and gut and barbel arrangement are all reminiscent of the family Nemacheilidae but all Serpenticobitis spp. possess a motile suborbital spine, a trait previously thought restricted to the family Cobitidae. The latter attribute prompted Roberts (1997) and Kottelat (1998, 2001) to place Serpenticobitis into Cobitidae although Nalbant (2001) apparently considered it a nemacheilid genus. Šlechtová et al. (2007) included S. zonata in a phylogenetic analysis for the first time and their results appeared to confirm the genus as a member of the family Balitoridae, but in 2012 Kottelat erected the new family Serpenticobitidae of which Serpenticobitis is currently the sole member. 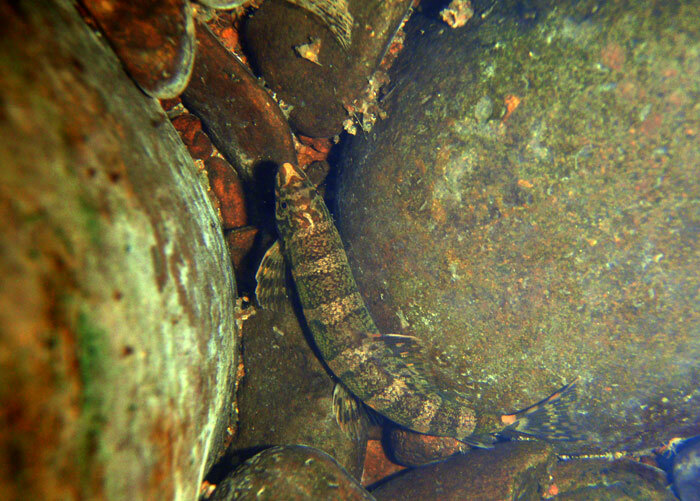 Serpenticobitidae is told apart from all other Cobitoidea families by the following combination of characters: body short and cylindrical in shape, with a barred colour pattern; head small, snout rounded and conspicuously overhanging; presence of a large bifid spine below eye; caudal-fin slightly forked; dorsal-fin origin anterior to pelvic-fin origin; pectoral fins oriented laterally; pectoral and pelvic fins with a single simple ray; mouth small and arched; upper and lower lips fleshy and continuous with one another; lower lip with a few folds and a median interruption but no mental lobes; presence of two pairs of rostral barbels and one pair of maxillary barbels; lower jaw partly exposed; anterior nostril pierced at front side of a flap-like tube; all fins containing rows of spots; presence of a large, conspicuous black spot at the caudal-fin base; swim bladder capsule comprises two smaller chambers connected to each other posteriorly and forming a canal referred to as the ‘manubrium’ located around the duct which connects the two halves of the anterior swim bladder chamber. Die systematische Stellung der Gattung Serpenticobitis. Serpenticobitis, a new genus of cobitid fishes from the Mekong basin, with two new species.